Welcome to Jokers Wild fun casino. 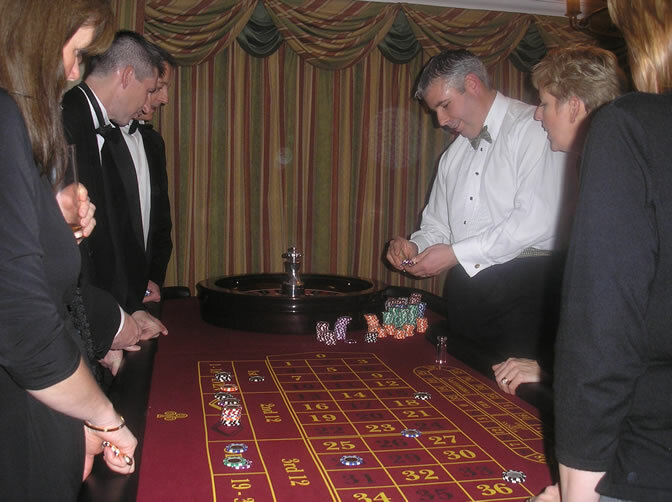 We are a family run business that brings the style and sophistication of a Las Vegas casino directly to your event. 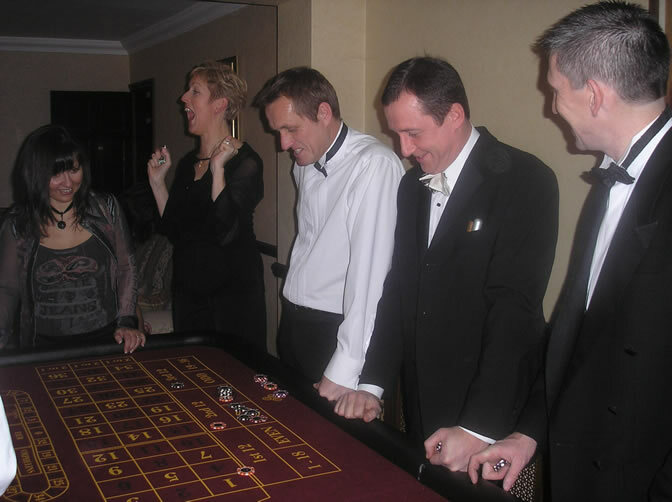 Jokers Wild fun casino will guarantee your guests a superb evenings entertainment-making your event a night to remember! Our ability to create an overwhelming first impression ensures your guests are provided with a positive lasting impression. We pride ourselves on being able to offer a high level of personal service, from quotation to completion, that so many companies fail to achieve. 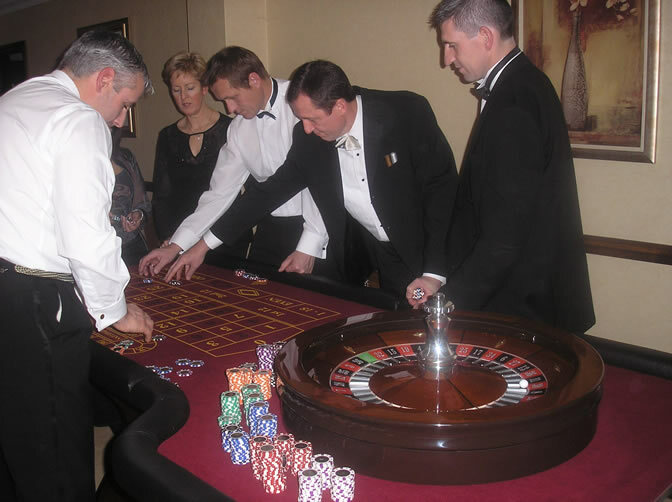 A fun casino allows your guests to enjoy an evening that many will never have experienced- the opportunity of gambling at authentic casino tables with experienced and friendly croupiers using casino quality accessories. 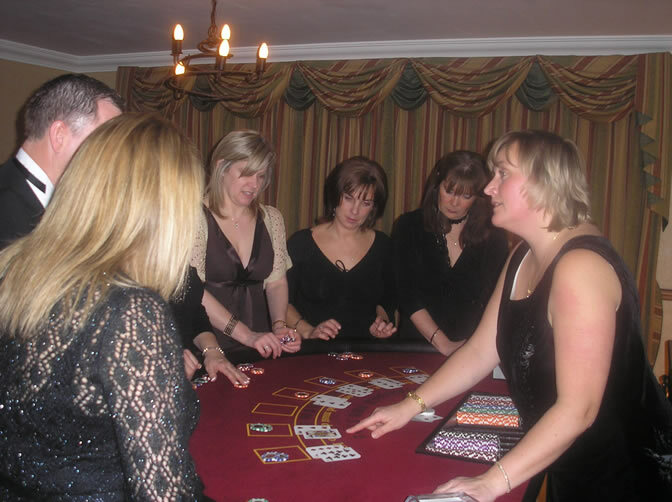 Of course, you are not expected to use your own money and guests receive a fun money voucher which is exchanged with the croupiers for the equivalent amount of chips. You are now ready to start - the world is your oyster!! Our all inclusive price also includes a complimentary bottle of "real" champagne which could be used as a prize for the guest that has accumulated the most amount of chips or alternatively kept and enjoyed by yourself!! 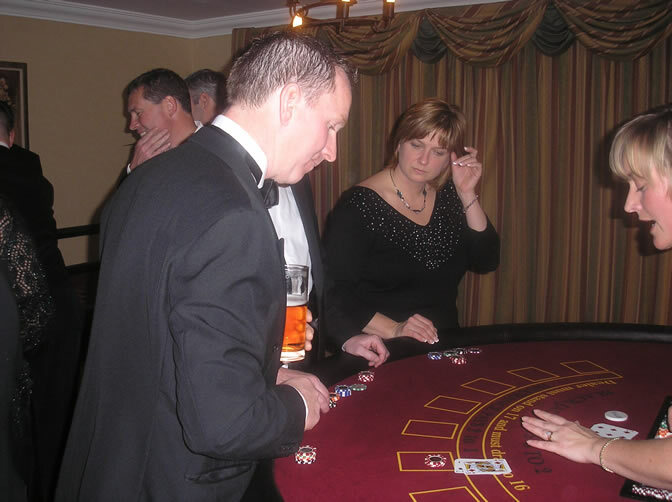 At the end of the evening the person or persons who have accumulated the most amount of chips is declared the winner. For a little added incentive the host can supply a prize or prizes - See above!. NO EVENT IS TOO SMALL! In our experience we have found that fun casinos work perfectly during the “lul” after the speeches and before the disco/band. That time when you are waiting for your evening guests to arrive and the room is being reorganised. Why not invite your “breakfast guests” to another room where, "the casino is now open and it costs you nothing!". After an hour or two of excitement they return to the main area where the room has been transformed and they can continue the celebrations. 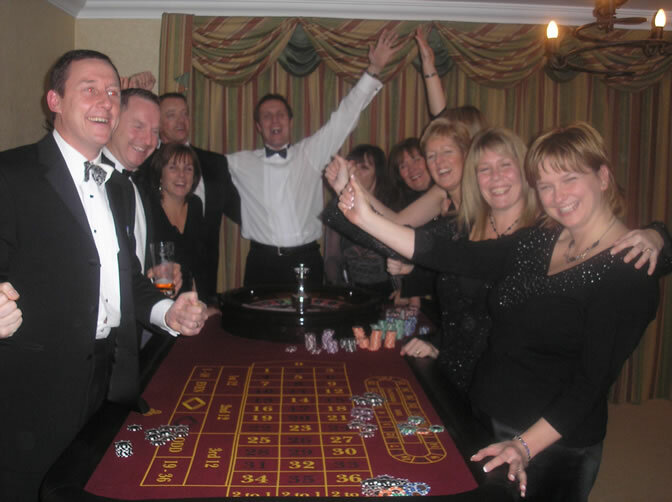 A fun casino is an excellent way of raising funds for a charitable organisation or simply to raise funds for that new rugby kit etc that your team badly needs. 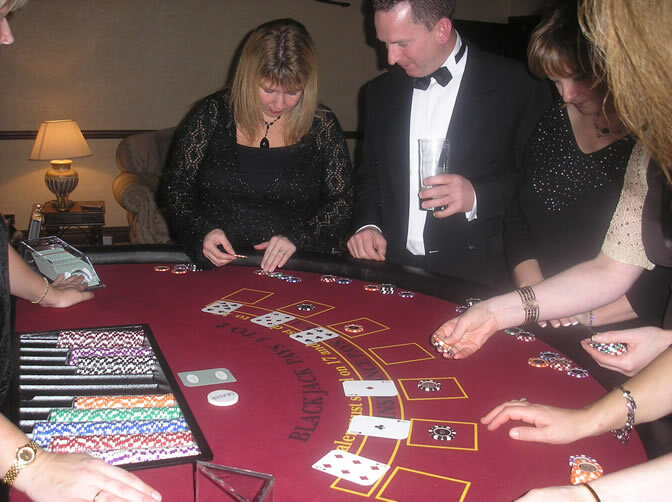 In a fundraising event players pay a nominal fee for their chips - and can buy in as many times as they wish with all the proceeds going to the group or charity nominated. Tickets can be sold to offset the cost of the casino and donated gifts can be awarded as prizes. If you display a list of prizes to be won then this will help to generate chip sales. The better the prizes the more people will spend on chips!. (a) guests can buy a Jokers Wild fun money voucher for a rate determined by you (ie £5) which is donated to a charity or special cause. All money must be collected by a representative of the nominated group or charity. (b) the proceeds must not be used for personal gain and under no circumstances are people allowed to gamble with real money. Our full size authentic tables have been hand crafted by quality tradesmen. We use 11g clay composite chips with steel centres and repackaged blackjack cards that have actually been used in a Las Vegas casino. 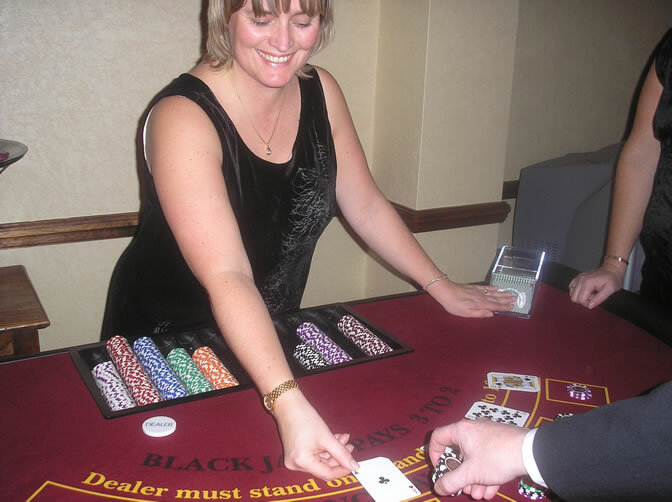 Blackjack: is basically a variation on the popular pontoon or 21’s (you know-that game that granddad taught you to play) In blackjack you are betting against the dealer and all the cards are turned face up except the dealers who has one card faced down. If you have a better hand than the dealer you win. 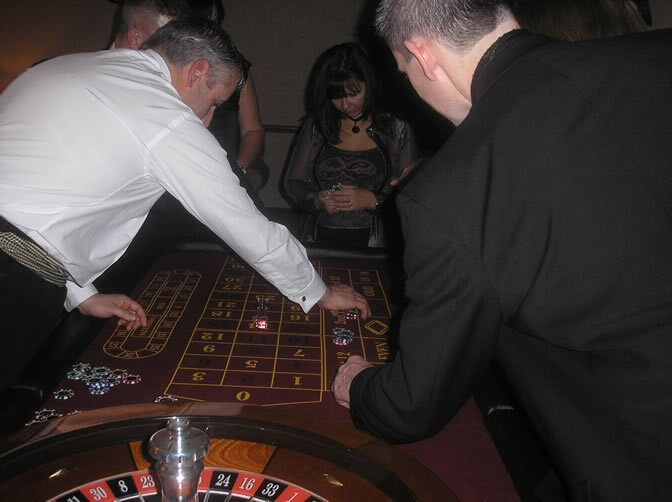 Roulette: is an easy game for the novice gambler with simple betting patterns and odds. Betting on a single number (straight) pays 35-1, on two numbers (split) its 17-1 and on three numbers (a row) its 11-1. Various other bets exist not forgetting even money for odds or evens, red or black. 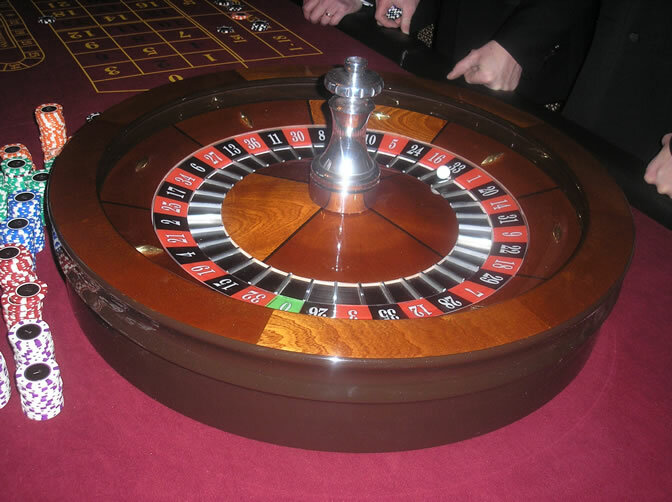 Even James Bond would agree there is nothing more simple than roulette with the excitement of your bet hinging on the turn of the wheel. Wheel Of Fortune: is an exciting and compulsive game to play appealing to guests of all ages. This is a large colourful wheel - approximately 36 inches in diameter - that is divided into 52 numbered segments. The guests place a bet on which number the indicator will be pointing at when the wheel stops. The wheel is spun and hopefully you are a winner!! 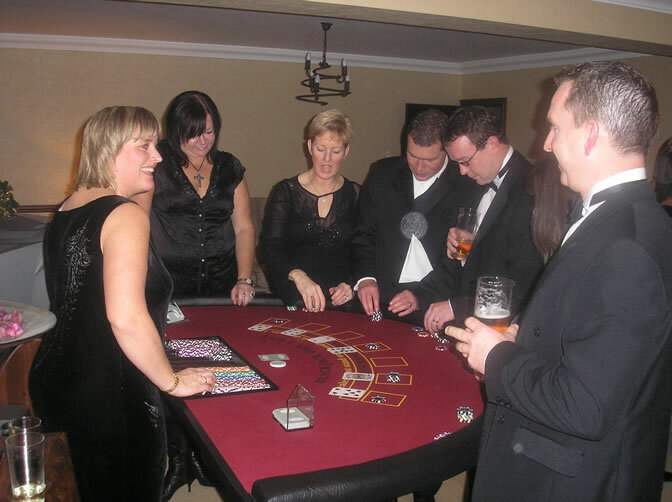 If you are organising a themed event, such as James Bond, Blues Brothers, Gangsters and Moll’s etc please do not hesitate to contact us as our croupiers may be able to dress accordingly. 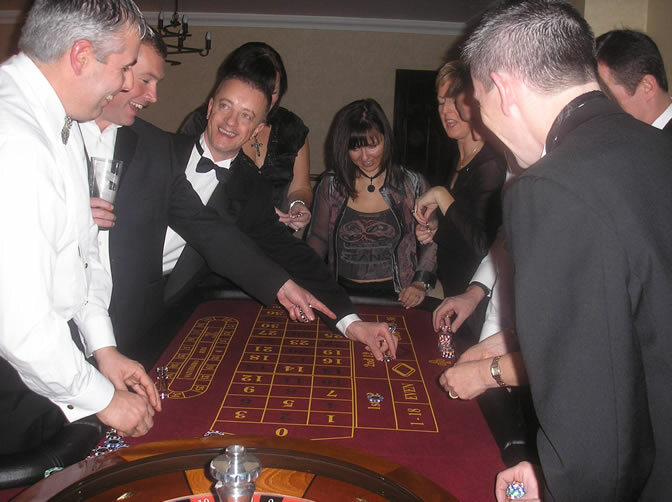 Your casino can operate at anytime of the day or night and for any length of time that you desire. However, we would normally suggest three hours to be sufficient - this allows enough time for your guests to be truly addicted!! If the host has supplied a prize / prizes or if you are using our complimentary bottle of champagne as a prize for the winner - we will count the chips at the end of the gaming time and declare a winner / winners. All sessions can be extended by mutual agreement. If you need any further help or assistance in planning your event please do not hesitate to give us a call or e-mail, our personal planner may be able to offer you some helpful advice. We hold Full Public Liability Insurance up to a maximum of £1,000,000. Instead of detailing the many complimentary letters that we receive from satisfied clients, we are prepared to go one step further and would be more than happy to provide referees with whom you could liase to confirm our outstanding level of professionalism and our high quality of service. AND REMEMBER. . . . . . . . . . . . . .DON’T GAMBLE - BET ON US! !